The alkaline phosphatase is a periplasmic homodimeric hydrolase. The poly-HIS tag can be used for protein purification (IMAC). The TEV tag can then be used to have the TEV protease specifically cleave off the poly-HIS tag from the purified protein . 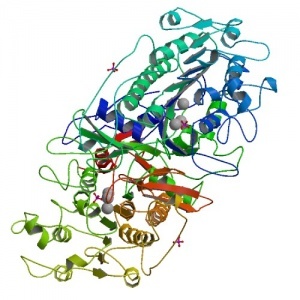 A form of this protein without TEV and poly-HIS tags can be found here. Alkaline phosphatases are used as reporter enzymes in different assays such as Western Blotting and in situ hybridization. Testing human blood for Alkaline Phosphatase levels is a routine test that can reveal different conditions. Alkaline phosphatases cleave phosphate groups from organic compounds by hydrolysis while retaining stereochemistry. A good explanation of the mechanism can be found here. Figure 2. 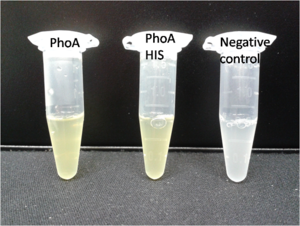 Liquid culture from the triple knockout E. coli strain overexpressing PhoA or PhoA-His respectively after reacting with pNPP. The negative control contains liquid culture without pNPP added. In order to assess whether addition of the His-tag impacts the function of the enzyme, liquid cultures of a ΔaesΔgusAΔnagZ Escherichia coli strain overexpressing PhoA and PhoA-His were incubated with pNPP. As can be seen from Figure 2, they appear to work equally well. Figure 3. Cell lysate from the triple knockout E. coli strain overexpressing PhoA-His after reacting with 4-MU-phosphate. 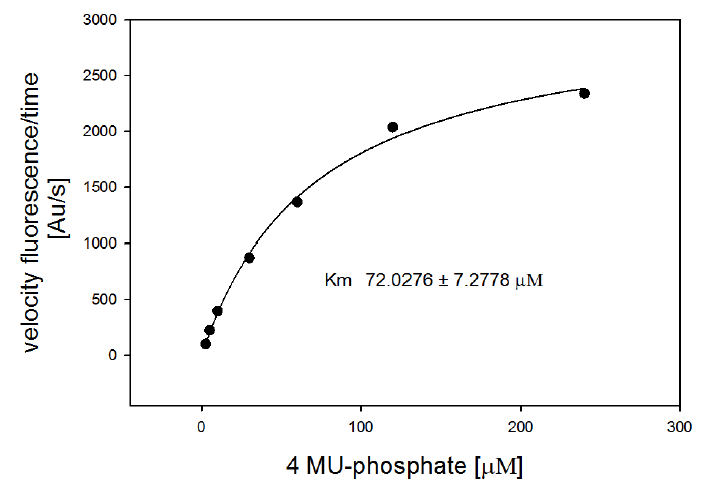 Cell lysate for the assay described below was tested for active enzyme in the same way, but with the fluorescent substrate 4-MU-phosphate (Figure 1). The picture in Figure 3 was taken with a common single lens reflex camera mounted on a dark hood at λEx 365 nm. Figure 1. Enzymatic reaction of PhoA with 4-MU-phosphate. To prove that the enzyme retained functionality with an additional His-tag, they conducted fluorometric assays to obtain Km values. To this end bacterial cells were grown until in exponential growth phase. Upon reaching this, gene expression was induced by AHL (see ETHZ system 2013). After another 4-5 h of growth, cells were harvested and lysed, the cell free extract (CFX) used for the fluorometric assay. The properly diluted CFX was measured on a 96 well plate in triplicates per substrate concentration. A plate reader took measurements at λEx 365 nm and λEm 445 nm. The obtained data was evaluated and finally fitted to Michaelis-Menten-Kinetics with SigmaPlot™. See the resulting graph below. Figure 4. Michaelis-Menten-Kinetics of PhoA-His cell lysate from E.Coli overexpressing PhoA-His: plots velocity versus substrate concentration (2.5 μL, 5 μL, 10 μL, 30 μL, 60 μL, 120 μL, 240 μL) in 20 mM Tris buffer of pH 8. A kinetic value for Km obtained by fitting the raw data to standard the Michaelis Menten equation; Km = 72.0 ± 7.3 μM. All assays were carried out in triplicates, results are presented as means. The phoA and phoA with His-Tag were overexpressed in the Escherichia coli BL21 DE3 strain, induced by 5 μM IPTG (iso-propy-β-D-1-thiogalactopyranoside) and finally harvested in order to obtain the cell lysate by lysozyme lysis. This cell lysate of both cultures were analyzed next to each other in two SDS-PAGE gels, one for comassie staining (blue gel in the picture) and one for western blotting (black picture) with Anti-6X His tag® antibody from mouse and a second reporter goat anti mouse antibody with a IRDye 680RD. 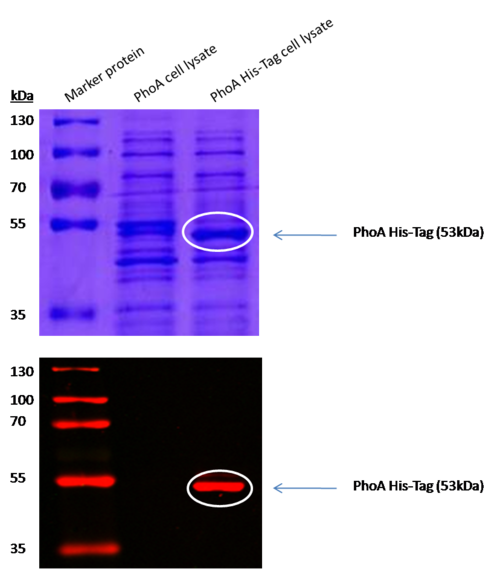 In the picture we can distinguish the PhoA His (53 kDa) on the western blot as well as on the SDS-PAGE gel (see white circles). Loghran ST, "Purification of poly-histidine-tagged proteins. ",Methods Mol Biol. 2011;681:311-35. doi: 10.1007/978-1-60761-913-0_17. Molecular Cell Biology, Fifth Edition, W.H. Freeman & Co., 2004. Adams & Victor's Principles Of Neurology, 7th edition, McGraw-Hill Professional, 2000.